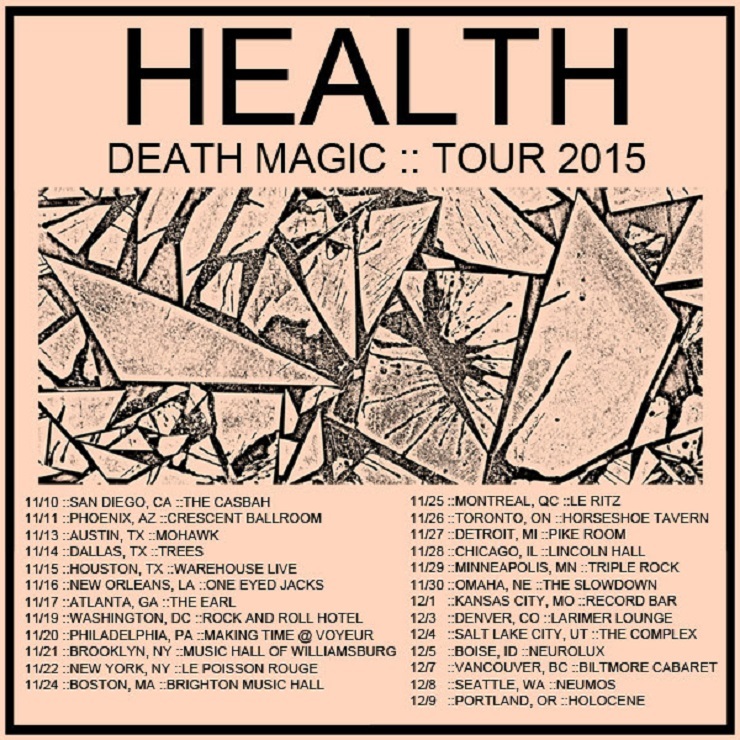 Noise- and pop-conjuring Los Angeles quartet HEALTH will be casting spells on crowds this fall on a North American tour supporting their recently delivered Death Magic LP. A press release confirms that while the band have a smattering of club shows and festival stops to help them get through the rest of the summer, their "Death Magic Tour 2015" doesn't officially get underway until early November. The tour routing has them kicking off the trip in Southern California. As you'll discover via the schedule down below, the trip veers eastward and up into Canada for stops in Toronto and Montreal. They then ricochet back towards the West Coast and will stop at Vancouver's Biltmore Cabaret on December 7 before wrapping the trip a couple days later in Portland. HEALTH recently unveiled their many plastic surgery disasters in the new video for Death Magic's "Stonefist." You'll find the clip beneath the concert info.